“An earthquake of a magnitude 7.9 struck off the coast of Alaska a few minutes past midnight (00:31 local time) on Tuesday, 23 January 2018 and was followed by a tsunami warning dispatched by the U.S. National Tsunami Warning Center. 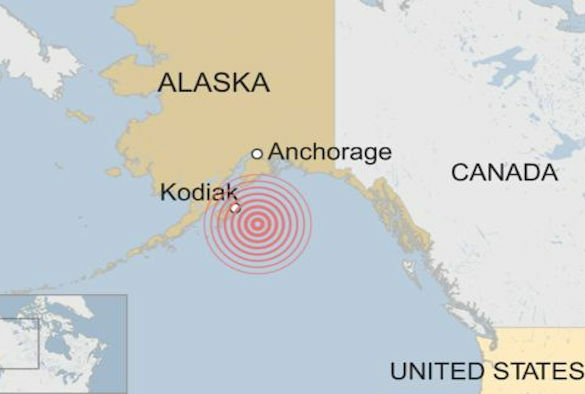 The earthquake was located by the U.S. Geological Survey 280 km SE of Kodiak Island, in the Gulf of Alaska, at a depth of approximately 25 km. Residents of Kodiak Island in areas at higher risk from tsunami inundation were warned to evacuate and move to high ground. The warning was lifted a few hours later, at approximately 4 am, when only small waves, less than 1 m high, had been detected. However, large magnitude earthquakes that occur at shallow depths near the ocean floor, can cause destructive tsunamis. A recent, dramatic, example is the tsunami that was triggered by the 2011, M9, Tohoku-Oki earthquake in Japan, which claimed more than 18000 victims. Powerful tsunamis are generated at subduction zones where two tectonic plates collide, and one slides underneath the other. Earthquakes that occur in this type of tectonic setting can cause large vertical displacement of the ocean floor as one plate pushes down, and the other moves up; it is this large vertical movement of the seabed that generates tsunamis.